The Bertram 46' Convertible is an American "fisherman" in its most classical concept, designed primarily for the specific use in fishing trips. This shows immediately from the uncommonly designed cockpit: and particularly from the freeboard, which is always very restrained over the surface, a fact that makes catching and hauling the fish on board a lot more easier; and, furthermore, from the accuracy with which all possible hindrance that might hamper the fight have been carefully avoided. For this reason, the 46' Convertible, like all the best fisherman yachts, is produced without the stern platform, an element which the purists of this sport consider to be of potential disturbance. Therefore the Bertram 46' Convertible features an aft deck which is not structural but can be added to the owner's desire for a less specific use of the craft. Characteristic of the layout of this version of the Convertible Bertram is also the steering position, invariably positioned on the flying bridge, which enables the helmsman a better steering precision in navigation, and better control of the boat during manoeuvres. This feature is particularly important during the fishing action, as it gives the helmsman the immediate perception of the development of the fight, i.e. if the prey is getting closer or further from the boat, so that he can steer the boat accordingly. As for the interiors, the Bertram 46' Convertible is designed for efficiency, strength, and the maximum ease in living accommodation in every part of the craft. On board, a lot of emphasis is placed on communal space, especially the saloon, the dining area and the galley, so that the day-time activity on the boat is enhanced. Nevertheless, the two sleeping cabins are spacious, soberly and very rationally styled and equipped with all comforts, air conditioning included. We particularly appreciated the owner's stateroom, which includes en-suite heads, a central double berth underneath which a very spacious locker is located. This is readily and easily accessible, as the double berth can be lifted hydraulically. The Bertram 46' Convertible can also be ordered with a different interior layout, featuring three double cabins, the third cabin with upper and lower bunks in place of the galley; the latter being moved to starboard, in the dining room area. For these reasons, and in spite of the highly specialised fishing approach, this craft cannot be classified just as a "fisherman" boat. The 46' Convertible is a true motor yacht, comfortable, safe, sound, versatile and with excellent navigating qualities. It has a very large hull, with good displacement; the bow is designed to be high on the water, as appropriate to a fishing boat; and it is not sensitive to wind blows, due to the modest deck structures. The modified "V" hull, narrow at the bow and definitely broader at the stern, enables the yacht to reach high speed even in formed seas, with maximum performance more than adequate to guarantee fast passages. Even at lower speeds, performance during the fishing action is excellent, providing no pitching or rolling and excellent manoeuvrability. Draft below propellers: 0,90 m.
Total weight with gear box: 3.292 kg. Price: with standard specification and installed engines: US Dollar 733.000. Construction and structures: reinforced fibreglass, hand-stratified with longitudinal and transversal balsa reinforcement. Foredeck: complete with a spacious standard bowsprit protected by a external hand-rail starting from the hatch; the anchor well, with a 1.500 Watt optional anchor windlass; a padded sundeck for four people can be optionally installed. Cockpit: On the yacht we tested there were two pieces of furniture, the port one housing a sink with fresh and salt water, drawers for lures etc. ; to starboard, the freezer tank. The four fishing rods holders on the rail are standard. Folding steps can also be used as settees. Courtesy lights are standard, as well as the electrical furling shore power cable, the sea-water washing pump, the shore fresh- water hose, the external padded bumper, the tuna door and the two side lockers, one of which houses the optional fresh water shower. Aft deck: optional, in fibreglass reinforced with balsa and carbon fiber sandwich for the gratings. Flying bridge: fibreglass structure with a balsa and carbon fibre sandwich for the gratings. Access is through a large aluminium ladder with Teflon steps. The flying bridge is fitted with two settees, the pilot's and co-pilot's, complete external padding, comfortable forward settee and five lockers. The bimini top is optional. 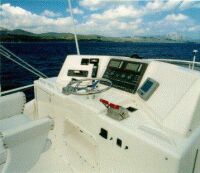 The steering console, with hydraulic steering wheel, is fitted with all the necessary controls and instrumentation for navigation and engine control; these can be replaced, like in the model we tested, with the D Deck layout, which features two multi-function liquid crystal monitor displays. Any type of electronic instrumentation can be installed on request. Layout and specifications: one cabin at the forward end with upper and lower bunks, complete with two small lockers, one tall locker and a hanging locker for long dress. This cabin has two reading lights, two spot lights embedded in the ceiling and two likewise embedded stereo loudspeakers. Vynil ceiling and laterals. To port, the laundry cabin with washer and dryer, both standard equipment. 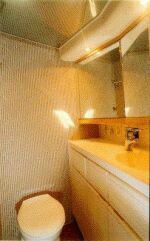 Amidships, on port side, lies the guest heads which have a separate shower box with parquet floors. An opening mirror and lockers underneath the basin complete the fittings of the guest heads. On the starboard side, the owner's stateroom with a central double bed under which a spacious drawer and a locker can be reached through a hydraulic system. 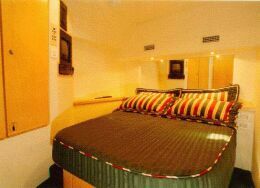 Two lateral shelves, a mirror and a tall hanginig locker, two reading lights, TV colour system with VCR; Hi-Fi system with two loudspeakers embedded in the ceiling complete the list of the owner's stateroom layout. En- suite spacious heads with separate shower box, with parquet floors and a large mirror. Galley: to port, at a different height compared to the cabin level, fitted with 150 litres each fridge and freezer, two electrical burners, micro-wave, powerful aerator, parquet floors, stainless steel sink with garbage compactor and, optionally, a stainless steel tank for the ice-maker. The area is furnished with four spacious lockers and four smaller food-lockers. 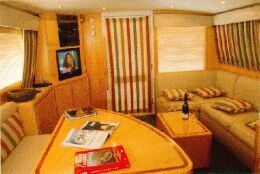 The saloon has a dining area to starboard, with L-shaped table and settee; right behind it lies a piece of furniture housing the Hi-Fi system complete with CD player and a column housing the CD player, colour TV and VCR; the dinette lies to port and can be converted into two bunks, with an L-shaped settee. Centralised vacuum cleaner and wooden lateral window-curtains "venziana"-style. In the ceiling a spacious holder for the fishing rods or other equipment. The saloon is lit by six embedded lights. Optional equipment: hydraulic lazzarette, tuna tower. Sea quality: the boat rides the waves in a very efficient way, without sacrificing comfort, even at high speed; excellent stability both with seas from the bow and at the stern; turning is adequately precise. Helm response and trim and flap: generally good for the helm, which is less precise only at very tight turning radius; excellent sensibility of the flaps, necessary to counter the tendency of the stern to sink. Visibility in different conditions: always excellent. Docking manoeuvrability: in spite of the strong breeze, the docking manoeuvres were not particularly difficult. Flying bridge: easily accessible, pleasant, well- accessories and quite well protected by the windshield. Interiors: extremely rational, sober, not quite American in taste and well-lit; the upholstery is commendable for its long- lasting qualities and functionality; the laundry area is particularly significant, being unusual on European crafts of this size. Passenger comfort: apart from the comfort granted by the excellent hull profile, this Bertram yacht provides spacious room both above and below decks; the living room is really comfortable. Steering position and comfort: the steering position is ideally located for the optimum control on course and manoeuvres; the digital instrumentation for the engine controls is ample and complete, and can also optionally feature electronic levers. The helmsman can canstantly monitor the development of the fishing situation. Chart table: it does not show any particular obstruction. Galley area: admirable for its functionality, fittings and spaciousness. Heads: comfortable, in tune with the overall rationality of the interiors, even if the owner's heads might have been a little more comfortable. Accessibility of the engine compartment: good accessibility and quite good functionality of the engine box, which definitely improves with smaller engines. Electrical equipment panel: easily read and accessible. the night area and the owner's heads which lack a little bit of personality in the interior design.